Get custom recommendations for boosting conversions on your landing pages with our grader tool. Learn what to fix in minutes. For many marketers, events are a natural extension of their existing content marketing strategy and a key channel for direct engagement. They’re a chance to build your brand and cultivate your identity while creating an amazing experience for customers and prospects alike. Pardon the Captain Obvious moment here, but for an event to be really successful, you need to get people there. And to get people there, you need to show them why they can’t afford to miss the event you’re about to put on. There’s no better way to create a sense of urgency than to send prospects to a persuasive event landing page. 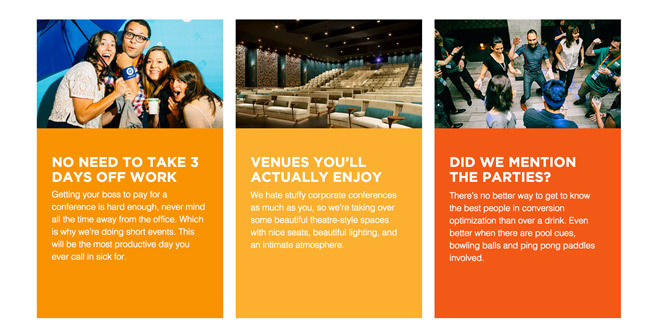 It’s where you’ll tell people exactly why they should come to your event and what they’ll get from attending. But if you think of your event as a one-day only play, you’re not getting the full value out of it. That’s why you should be using landing pages in every stage of your event marketing campaign — before, during and after the event itself. With our Call to Action conference coming up in less than a month, we thought we’d share with you a few of the landing pages that we’ve used for our own events– but first, let’s dig into the elements that make event landing pages successful. Remember that your conference is a product. As with all products, there is a cost vs benefit consideration, and it’s up to you to tilt the scales in favor of the benefit on your landing page. To get those scales tilted, you’ll need to break out the five elements of a high-converting landing page. 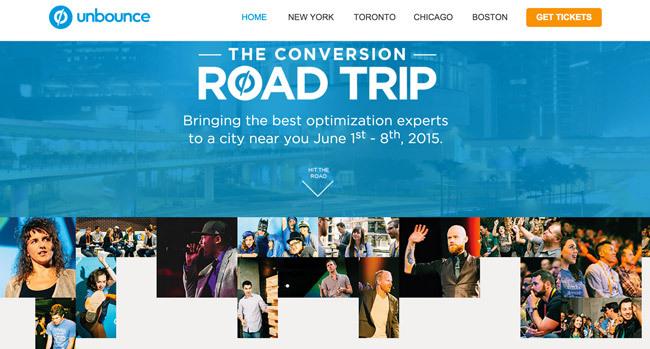 Let’s take a look at what they are, and how we made use of them on the landing page for the Conversion Road Trip, a series of four conversion-centered marketing events we hosted earlier this summer in Boston, Chicago, New York and Toronto. Your event landing page needs to explain why people should attend your conference as opposed to one of the many others in your space. It’s job one on any landing page! 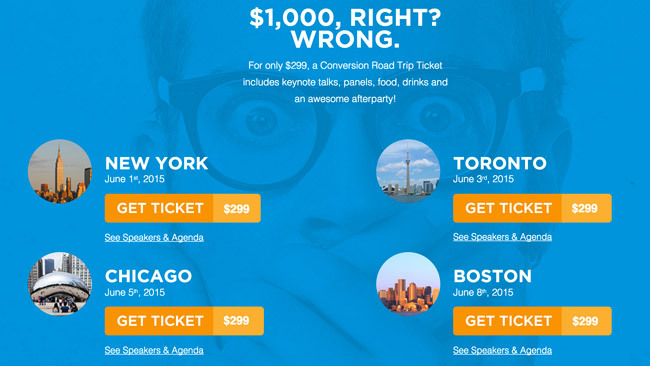 Your event landing page needs to explain why people should choose yours over the others. The hero shot is the image that shows your product, and helps to convey a sense of what using that product will be like. For the Conversion Road Trip, we combined several images to convey a sense of going on the road, along with images of the speakers pouring their hearts out and conference attendees in rapt attention. Using video in this spot can also help you project the feel of your event. Showing the energy and excitement of the conference will pique your audience’s interest, and get them wanting to know more. Give your prospects solid reasons to go to your conference, and they’ll have that much more interest in attending. Show the potential attendee what they’re going to be taking away from the event — the valuable information that they’ll be able to put into practice when they get back to the office. Trust is subjective. Make sure you A/B test your social proof to ensure it is really driving conversions. All landing pages should have one goal and only one goal. In the case of an events landing page, that goal is to get people to register – by clicking your call to action button. It’s also worth mentioning that we included the ticket price next to the bright orange CTA. Normally, adding a dollar amount near any CTA will likely cause a bit of friction. That’s why we lead with a headline that set up $1,000 as the price of typical marketing conference. Juxtaposing that with the actual ticket price (at a fraction of the cost), made $299 sound like a pretty good deal! This is called the anchoring effect and it’s a classic – and effective – persuasion tactic. Your CTA is what ultimately triggers conversions, so make sure you’re A/B testing different CTA copy. Let the audience decide which one is best. Conference preparation begins months in advance. Our planning starts 9-12 months before the date in order to make sure that we have everything in place, from the marketing plan, to the content, to the event logistics. In the months leading up to your conference, you can start to collect email addresses from interested prospects, and give them updates along the way that will help convince them to get a ticket. With so many speakers involved, you don’t always have all of them lined up when we first announce the conference. This presents both a problem and an opportunity. The problem is that you can’t showcase all of our speakers right away — you’re not able to show people everyone that will be there and all of the things they’ll learn, which provides valuable social proof. You do, however, have the opportunity to collect email addresses from people who are interested in attending, and can reach out to them as we lock down speakers, creating hype and keeping our event top-of-mind. We get a very engaged email audience through this process – the open rate for emails sent to people who requested CTAConf updates have been as high as 72.6%. Not too shabby, right? 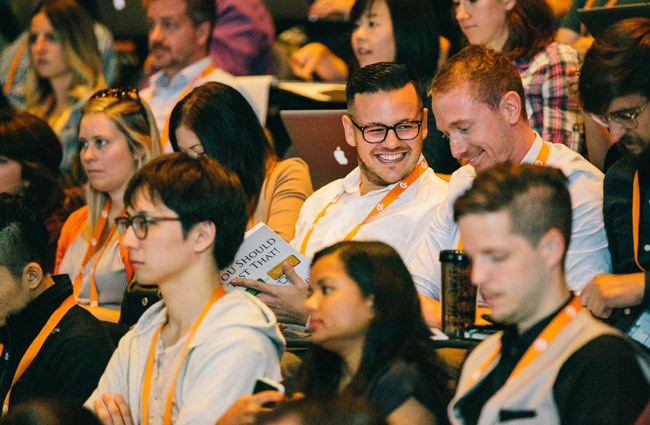 A conference isn’t just about delighting, networking, and creating buzz. At the end of the day, you want to make it as easy as possible for people to sign up for your product. Guess what? You need a landing page for that too. 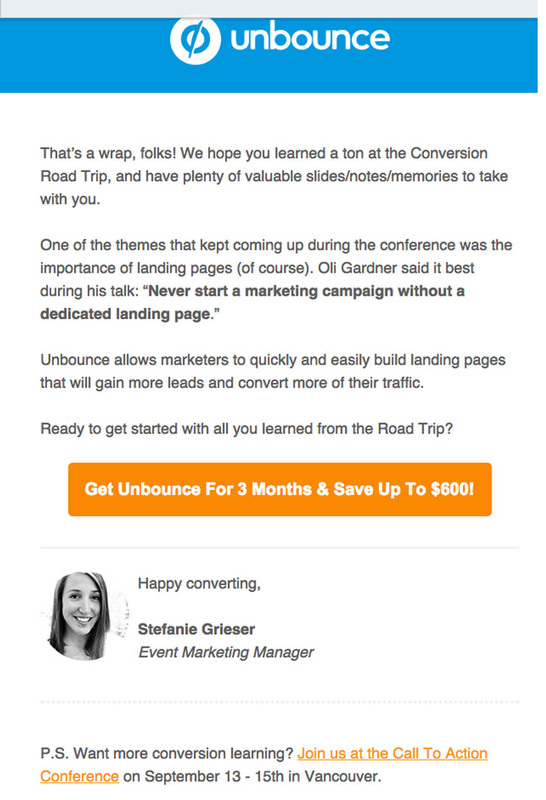 At our conferences, we also have an attendee-specific landing page to incentivize people to sign up for Unbounce. We include an exclusive “attendee-only” discount to add extra incentive, and we hand out the landing page URL and promo code at our demo booth. At MozCon, we had a lot of people come by our booth to chat, and were able to show many of them how Unbounce works in person. Coupling that with a substantial discount helped gently nudge interested prospects towards becoming customers. It talks about the importance of landing pages and offers them a discount – which they can retrieve by clicking through to the landing page we created specifically for the event. But there’s still more you can do after your conference is over. You’ve managed to get people to your event. Congratulations! Don’t forget though, that there is more you can do to collect leads when it’s over. You’ll see that we altered some of the copy to explain a bit about the conference and what people got out of it. Most importantly, we added a video section, where visitors could watch all the recorded talks in exchange for their email address. 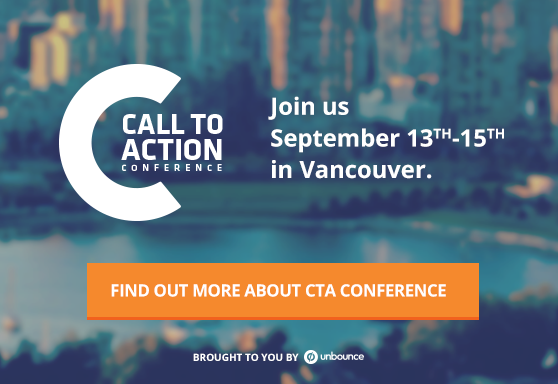 This allowed us to offer great value to our audience, while creating a list of people we could reach out to when it was time to sell tickets for CTAConf 2015. There is also a CTA at the bottom that allows people to add their email address to get updates about the upcoming conference, bringing us back full circle to the first iteration of this page, which did the same thing. Your landing page is the lynchpin of your event marketing campaign, but it will only be useful if you can get people to the page. No matter what channels you’re using to drive traffic (email marketing, social media, PPC), your landing page should deliver on the promises that you set up in your promotional messages and images. PS: Wanna come to CTAConf? We’ve got a special discount for our blog readers. Get an exclusive 30% discount at checkout by using the promocode “UnbounceBlog” until Friday, August 28th.